Holarrhena antidysenterica L. of the family Apocynaceae is also known as conessi bark in English, kutaja in Sanskrit, kura or kurchi in Hindi and found throughout many forests of India, in Travancore, Assam and Uttar Pradesh. Holarrhena antidysentrica Linn. f is a small deciduous tree, with brown bark. The bark contains a large number of alkaloids such as conessine, holonamine, kuchine, kurchicine, holarrhimine and conimine., It acts as a good astringent, anthelmintic, amoebicidal and has diuretic-like property. The bark and seeds have been used in the treatment of many diseases such as colic, dyspepsia, piles, dysentery, diseases of spleen, diseases of the skin, diarrhoea, anaemia, epilepsy, stomach pain and cholera. Kurchicin, an active principle of Holarrhena antidysenterica, is highly effective against causative microorganisms of diarrhoea and dysentery, especially amoebic types. It has huge medicinal values due to the presence of a large number of alkaloids. In Homoeopathy, Holarrhena antidysentrica is used for the complaints of both chronic and acute dysentery with large quantity of mucus, excessive blood, colic pain, fever, piles, leprosy and skin diseases, tenesmus, emaciation, loss of appetite and aversion of food colicky around the navel, aggravated by lying on the right side but better by lying on the left side. According to the Homoeopathic Pharmacopoeia of India, its bark is used for the preparation of mother tincture. The plant material Holarrhena antidysenterica was supplied by the Centre for Medicinal Plant Research in Homoeopathy, Nilgiris, Tamil Nadu. In-house mother tinctures were prepared from authentic materials and the other three mother tinctures were purchased from market. All solvents used in this study were of analytical grade, and purified water was of high-pressure liquid chromatography grade. 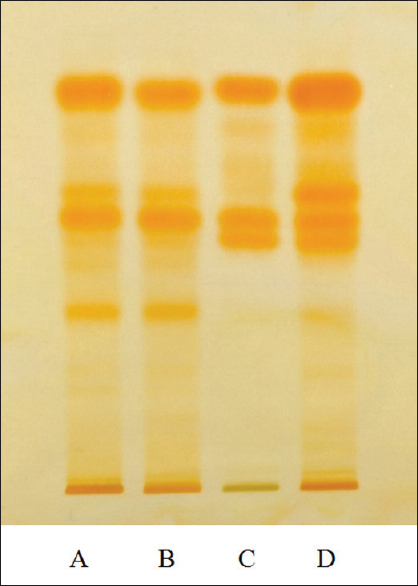 Post-chromatographic derivatisation of developed Thin-layer Chromatography (TLC) plates was done using Dragendroff's reagent. Dragendroff's reagent was prepared by dissolving 0.85 g-basis bismuth nitrate in 10-ml glacial acetic acid and 40-ml water under heating if necessary (Sol. A). Sol. B was prepared by dissolving 8-g potassium iodide in 30-ml water, and then stock solutions A + B solutions were mixed 1:1 (v/v) and 4-ml glacial acetic acid and 20-ml purified water were added. Freshly prepared solution of 10% sodium nitrite was used for better visibility of high-performance TLC (HPTLC) plate. 100 g of coarsely powdered bark was taken and 635-ml alcohol and 400-ml water were added to make 1000 ml of mother tincture using the percolation method (as per the Homoeopathic Pharmacopeia of India). CAMAG Spotting device – Linomat V automatic sample spotter; syringe: 10 μL (Switzerland); TLC chamber – Glass twin trough chamber (20 × 10); densitometer – TLC scanner 3 with visionCATS software; CAMAG; HPTLC plate – 20 cm × 10 cm, pre-coated silica gel 60F254 plate. Phytochemical tests were conducted from the bark of Holarrhena antidysenterica to identify the various phytochemicals present in the plant material. The various tests, are described below and observations are recorded in [Table 1]. Sulphuric acid (H2 SO4 test): The test solution was treated with concentrated H2 SO4. Formation of orange colour indicates the presence of flavonoids. Mayer's test: To 2–3 ml of the filtrate, add a few drops of Mayer's reagent. Formation of cream precipitate indicates the presence of alkaloids. Salkowski's test: To the test solution, add a few drops of concentrated sulphuric acid, shake well and allow to stand for some time. Red colour appears in the lower layer indicating the presence of sterols, and formation of yellow-coloured lower layer indicates the presence of triterpenoids. Salkowski's test: Chloroform solution of the extract when shaken with concentrated acid and on standing yields red colour. Sodium hydroxide reagent: Dissolve a small amount of alcoholic extract in 1 ml water and add sodium hydroxide solution. A yellow colour indicates the presence of glycosides. Froth test- A pinch of the dried powdered plant material was added to 2–3 ml of distilled water. The mixture was shaken vigorously. Formation of foam indicates the presence of saponin. The concentrated chloroform extracts (A, B, C and D) were used for the HPTLC study. The extracts were spotted in the form of band of width 8.0 mm with a microlitre syringe on pre-coated silica gel aluminium plate 60F254, using a Linomat V sample applicator. A constant application rate of 3 and 5 μL was employed. The slit dimension was kept at 6.00 mm × 0.30 mm, and 20 mm/s scanning speed was employed. The mobile phase (10 ml) consisting of cyclohexane: chloromethane: diethylamine (7:3:1 v/v/v) was taken for HPTLC analysis. Linear ascending development was carried out in a 20 cm × 10 cm twin trough glass chamber (Camag, Switzerland) saturated with the mobile phase at room temperature for 25 min. The length of the chromatogram run was 8 cm and, subsequent to the development, the TLC plates were dried in a current of air with the help of hot air dryer in a wooden chamber with adequate ventilation. Densitometric scanning was performed at 254 nm and 366 nm by reflectance scanning and operated by visionCATS software resident in the system. With spectrophotometer set at range 190–1100 nm, samples and standard were put in cuvettes. Before analysis, cuvettes were washed with ethanol, analysis was performed on Specord 200 plus spectrophotometer Analytical Jena AG, Konrad-Zuse-Str.1, 07745 Jena, Germany and Analytical Jena WinAspect software was used for the ultraviolet (UV) analysis. Samples (in-house mother tincture used for UV analysis) were prepared by mixing 1 part of mother tincture and 99 parts of absolute alcohol (1:99) and filtered through membrane filter prior to UV analysis. The determined data under the physicochemical study for the raw drug are summarised in [Table 2]. 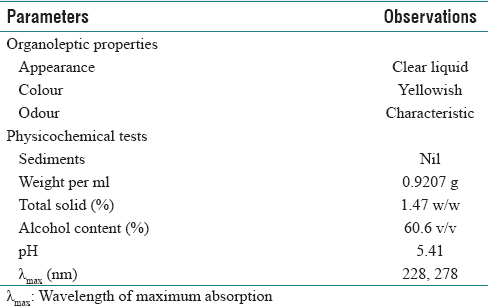 Mother tincture preparation and its standardisation are summarised in [Table 3] and [Table 4], respectively. Qualitative phytochemical test loss on drying revealed the presence of water in the plant and also some volatile organic matter. Results of physicochemical studies are summarised in [Table 1], [Table 2], [Table 3], [Table 4]. Holarrhena antidysenterica in-house mother tincture was prepared in the laboratory and labelled as A and other three mother tinctures purchased from the market were labelled as B, C and D. The profile of chromatographic separation was scanned at 254 nm and 366 nm wavelength. At 254 nm, five spots appeared in in-house mother tincture (A) at Rf0.20, 0.35, 0.44, 0.73 and 0.87; five spots appeared in market sample (B) at Rf0.21, 0.33, 0.46, 0.72 and 0.86; four spots appeared in sample (C) at Rf0.34, 0.43, 0.74 and 0.88 and four spots appeared in sample (D) at Rf0.36, 0.42, 0.71 and 0.86 (all brown) [Figure 1]. While chromatogram scanned at 366 nm showed six spots in in-house mother tincture (A) at Rf0.21, 0.31, 0.53, 0.59 0.73 and 0.89, five spots appeared in market sample (B) at Rf0.32, 0.51, 0.58, 0.72 and 0.88; five spots appeared in sample (C) at Rf0.31, 0.54, 0.60, 0.72 and 0.90 and six spots appeared in sample (D) at Rf0.20, 0.31, 0.55, 0.59, 0.74 and 0.89 (all blue) [Figure 2], chromatogram after spray Dragendroff's reagent and then 10% sodium nitrite showed five spots in in-house mother tincture (A) at Rf0.28, 0.38, 0.43, 0.47 and 0.63; five spots appeared in market sample (B) at Rf0.27, 0.37, 0.43, 0.48 and 0.61; three spots appeared in sample (C) at Rf0.39, 0.42, 0.62 and five spots appeared in sample (D) at Rf0.28, 0.37, 0.42, 0.46 and 0.61 (all orange) [Figure 3]. It is evident from the data that these are characteristics for the studied drug, which will help in the identification and authentication of the mother tincture. The HPTLC chemoprofiling of in-house mother tincture (A) and market sample (B, C and D) was almost similar. However, excess amount of active constituents were found in in-house homoeopathic drug/tincture (A) rather than the market samples (B, C and D). These may be considered as valuable standards in pharmacopoeia and act as vital fingerprint parameters to ensure the reliability and reproducibility of the drug. UV absorption spectra (λmax) of in-house mother tincture of Holarrhena antidysenterica were found at 228 nm and 278 nm [Figure 4]. Physicochemical and Phytochemical analysis using various reagents showed the presence of secondary metabolites such as tannins, phenolic compounds, alkaloids and flavonoid. Physicochemical constants, namely, ash, extracted values and other parameters can be used as a reliable aid to check the identity, purity and strength. HPTLC chemoprofiling is done as an important tool for the authentication of herbal drugs and formulations. The results obtained from the study could be utilised for scientific validation and formulating standards for the quality assurance of the drug. In HPTLC chemoprofiling, the developed chromatogram and Rf values of bands will be specific for the drug with the selected solvent system. UV spectroscopic study exhibits prominent peaks, which serve as characteristic standards. The present physicochemical and phytochemical study of Holarrhena antidysenterica L. reveals that its bark is rich in phytoconstituents. In UV spectroscopy, λmax values of active constituents of Holarrhena antidysenterica L. were observed at 228 and 278 nm in HT. 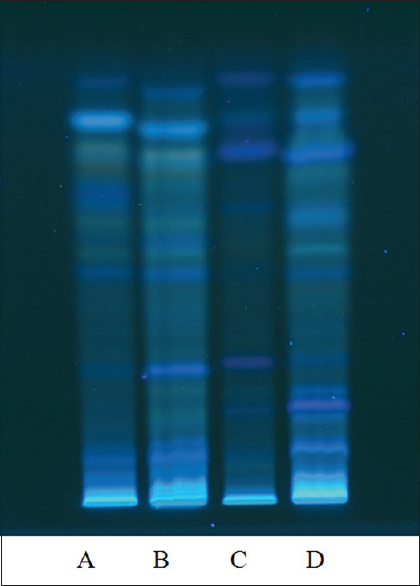 HPTLC Chemo profiling study shows bands of active constituent were observed in all the four samples, in-house HT (A) and three market samples (B, C and D). However, excess amount of active constituents were found in in-house HT (A) rather than the market samples (B, C and D) [Figure 1], [Figure 2], [Figure 3]. Hence, the present physicochemical, phytochemical and Chemoprofiling fingerprinting data of Holarrhena antidysenterica L. may be considered as pharmacopoeia standards for the aforesaid drug. Johari S, Gandhi T. A randomized single blind parallel group study comparing monoherbal formulation containing Holarrhena antidysenterica extract with mesalamine in chronic ulcerative colitis patients. Anc Sci Life 2016;36:19-27. Asmita N, Laddha KS. Effect of enzymes on extraction of phytoconstituents from Holarrhena antidysenterica. Int J Pharmacol Phytochem Res 2013;5:68-73. Vikramaditya. A Compendium of Active Principles/Phytochemicals of Medicinal Plants used in Homoeopathy. Ghaziabad: Homoeopathic Pharmacopoeia Laboratory; Vol. 1.; 2001. p. 63. Ali Shah SM, Usmanghani K, Akhtar N, Asif HM, Akram M, Ahmed K, et al. Monograph of Holarrhena antidysenterica (Linn.) Wall. Int J Phytomed 2010;2:345-8. Pulikkottil AJ. Holarrhena antidysenterica (Linn.) Wall. Synonym H. pubescens (Buch. Ham.) Wall. ex G. Don. Family: Apocynaceae; Holarrhena antidysenterica. Encyclopedia of Medicinal Plants. Herbs – Medicinal plants usage and Identifi cation Data Base. ; 2016. Sharma PC, Yelne MB, Dennis TJ. Database on Medicinal Plants Used in Ayurveda. Central Council for Research in Ayurveda and Siddha. Department of ISM & H, Ministry of Health and Family Welfare, Government of India. Reprint 2005. Vol. 2, 3. New Delhi: Pearl Offset Press Pvt. Ltd.; 2005. Bhutani KK, Ali M, Sharma SR, Vaid RM, Gupta DK. Three new steroidal alkaloids from the bark of Holarrhena antidysenterica. Phytochemistry 1988;27:925-8. Daswani P, Birdi TJ, Antarkar DS, Antia NH. Investigation of the antidiarrheal activity of Holarrhena antidysenterica. Indian J Pharm Sci 2002;64:164-7. Boericke W. Homoeopathic Materia Medica and Repertory. Reprint Edition. New Delhi: B. Jain Publisher (P) Ltd.; 2007. p. 1063. Dutta AT, Ghosh BK, Gupta JC. The seasonal variation of alkaloids in different parts of Holarrhena antidysenterica wall. and the alkaloid content in the bark at different ages. Part 1. Indian J Med Res 1950;38:467-72. Government of India, Ministry of Health and Family Welfare, Indian Pharmacopoeia. Vol. 1. Ghaziabad: The Indian Pharmacopoeia Commission; 2014. p. 782. Government of India, Ministry of Health and Family Welfare. Homoeopathic Pharmacopoeia of India. Vol. 1. New Delhi: The Controller of Publications; 1971. p. 133. Chandrashekar R, Rao SN. Phytochemical analysis of ethanolic extract of leaves of Leucas indica (EELLI). Int J Pharm Bio Sci 2013;4:33-8. Koteswar Sarma DS, Suresh Babu AV. Pharmacognostic and phytochemical studies of Thespesiapopulnea Linn. J Chem Pharm Res 2011;3:327-244. Gupta AK, Neeraj T, Madhu S. Quality standards of Indian medicinal plants. Indian Council of Medical Research 2003;1:109-16. Wagner H, Bladt S, Zgainski EM. 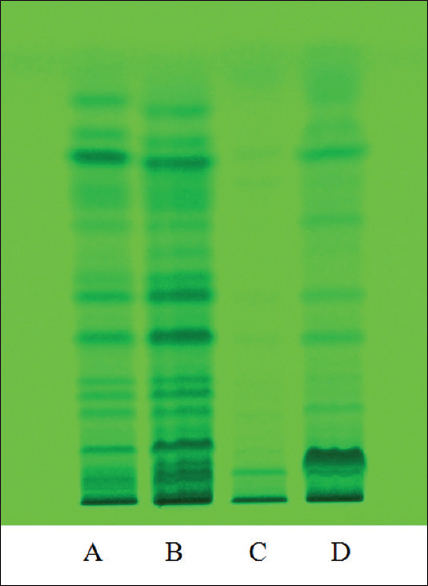 Plant Drug Analysis: A Thin Layer Chromatography Atlas. Berlin: Springer-Verlag; 1984. p. 5-6.